Choose to live healthy with NutraVigour Organic Green Coffee Beans. The most innovative method of reducing body fat by means of the green coffee bean is already the world number 1 alternative to diets and exercise. Green coffee beans contains chlorogenic acid ( GCA )main active ingredient for weight loss. These decaffeinated and unroasted organic green coffee beans support your weight management goal and metabolism. 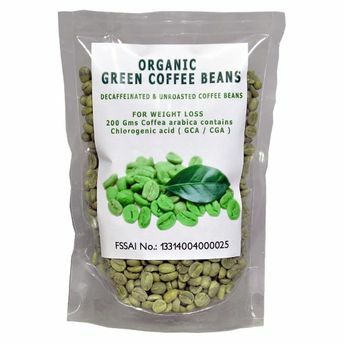 Effective for weight management, these organic green coffee beans are 100% vegetarian, pure, safe, easy to use and the most innovative method of reducing body fat. Contains chlorogenic acid ( GCA ) primary active ingredient for weight loss. Reduces body fat and eliminates weight gain. Slows the release of sugar into the bloodstream. Enriched with comprehensive antioxidant effect. Regulates blood glucose and circulation. Boosts the metabolism by burning fat in the liver. Explore the entire range of Weight Loss available on Nykaa. Shop more NutraVigour products here.You can browse through the complete world of NutraVigour Weight Loss .Alternatively, you can also find many more products from the NutraVigour Organic Decaffeinated Green Coffee Beans range.